If you're looking for an opportunity to help your community in a lasting way, you may wish to consider taking advantage of volunteer opportunities with senior citizens. Elderly people are often great sources of experience, so you can learn important perspectives from previous generations. Along with stories from the past, you'll be rewarded with the great feeling that comes with charitable giving and accomplishments. By experiencing the appreciation of people who need your assistance, you'll also understand what it means to be a valuable member of society. Many people understand volunteering with senior citizens is a great way to give back to their communities, but they often don't know exactly how they can help. Fortunately, most communities make it rather easy to find opportunities to offer your time to elderly citizens. If you have elderly neighbors and relatives, you don't even have to join an organization to help your community's oldest members. By visiting your elderly acquaintances on a regular basis, you can form strong friendships while playing games and sharing stories. Few people enjoy feeling alone, so be genuine when you interact with senior citizens. You can do this by speaking about a topic the elderly person is truly interested in. Ask about his life, and learn about skills he mastered during his lifetime. If it is difficult to regularly visit your elderly friends, consider using video conference software like Skype. Since many senior citizens can no longer drive, you can help them by volunteering to be their driver. For an hour or more each week, you can help seniors run errands. While you're helping your elderly friend run errands, you can entertain them with friendly discussions about topics he is interested in. Many senior citizens have health problems preventing them from performing normal tasks, so you can help them by maintaining their home and lawn. From cutting their grass to winterizing their homes before cold months, your volunteering efforts can improve the quality of life for elderly people. If you don't know any senior citizens in your community, you can plan a visit to a local assisted living facility. After planning a visit with the facility's management team, you can interact with senior citizens through games and conversation. This is often a great way to meet war veterans and other people from important moments in history. If the person you visit isn't interested in talking, you can give them the option to write their thoughts in a journal; many introverts will appreciate this option. People who find they really enjoy helping senior citizens may be able to help the assisted living facility as a volunteer staff member. You can also help people at these facilities by playing live music, cooking, and organizing special events. To learn about regular opportunities to help seniors, you can join an organization like the National Council on Aging. These groups will also keep you informed about issues affecting elderly people. 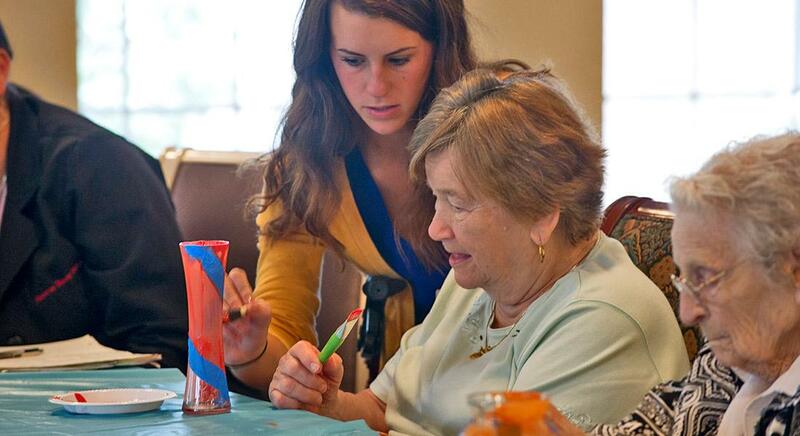 Participating in volunteer opportunities with senior citizens can give you the satisfaction of helping people in need. While you help others, you'll learn important skills about life. Volunteering with senior citizens is certainly a humbling experience you'll never forget.